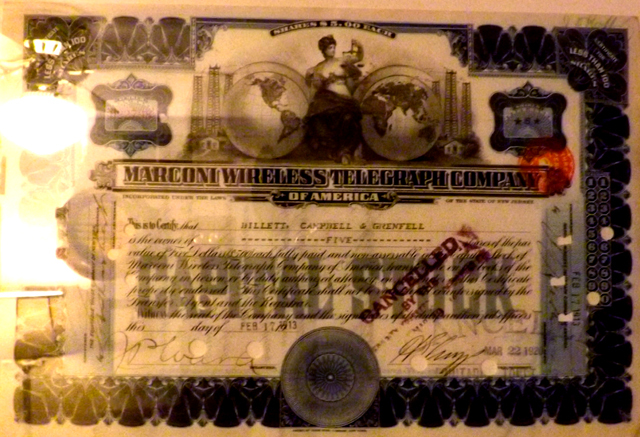 With the advent of inventor and physicist Guglielmo Marconi's successful wireless transmission of signals between distant points, the Marconi Wireless Telegraph Company established itself in the worlds of business and shipping. 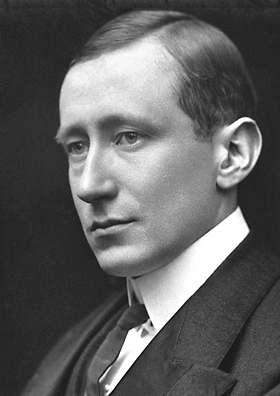 The company saw little activity in the very early years following Marconi's famous experiments. 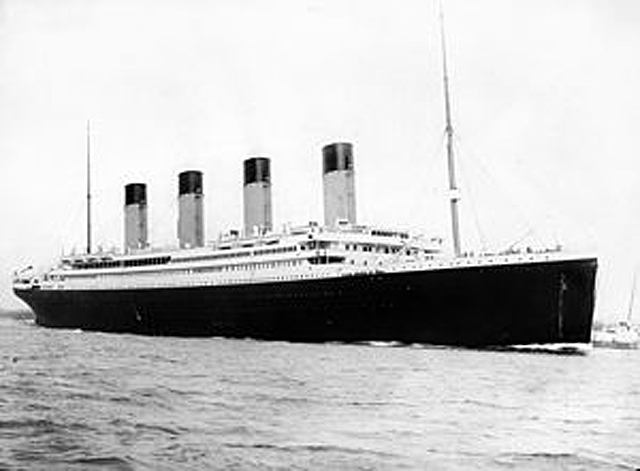 It wasn't until it became known that communications via Marconi's wireless systems, were directly responsible for rescue help reaching the sinking steam ship Titanic after it struck an iceberg and sank on its maiden voyage, that the company's future was secured. 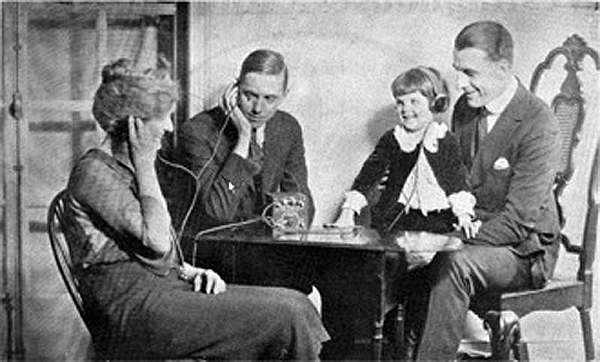 Interestingly, Marconi never envisioned his "wireless" as an entertainment medium or a household fixture to bring news, music and structured programs into the home. His early vision was that the device would be used as a method of additional safety for shipping interests. It was actually a sixteen-year-old Marconi employee, a Russian immigrant named David Sarnoff, who realized the implications of Marconi's invention with regard to Radio as we know it. 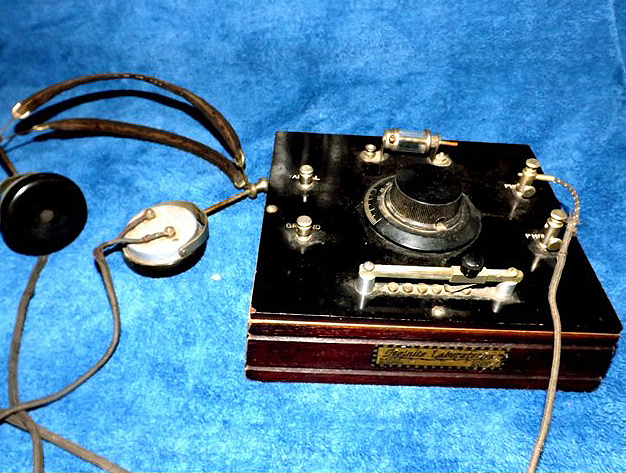 The sinking of the RMS Titanic in 1912, provided an opportunity for the world to see the value of the Marconi Wireless Telegraph as a safety device for ship-to-shore communications. 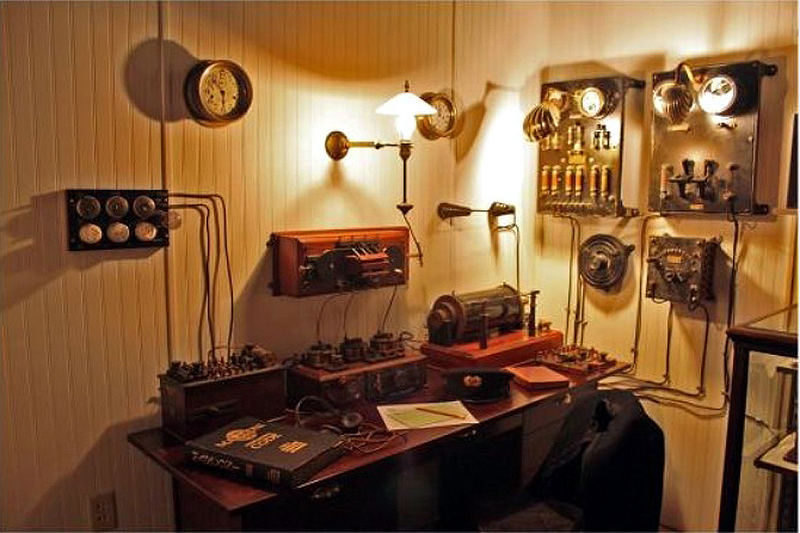 It was via the ship's radio telegraph station that the first distress signals were sent on that fateful night. Although other ships were hours away, having radio contact is credited with the eventual rescue of a portion of the Titanic's passengers. David Sarnoff, in his position as a station operator at the Marconi Wireless Telegraph Company's east coast ship-to-shore receiving station, as he would have appeared on the night of the steam ship Titanic disaster. Sarnoff is the operator credited with receiving the reports from the Marconi radio system aboard the Titanic, and relaying the information to vessels which were in a position to assist with the later rescue of survivors. After that event, Sarnoff went on to become chairman of the Radio Corporation Of America, where he was able to deploy his ideas regarding radio as a medium of news and entertainment in the American home and workplace. In his role as RCA chairman, Sarnoff pioneered consumer radio manufacturing, and also founded the National Broadcasting Company. 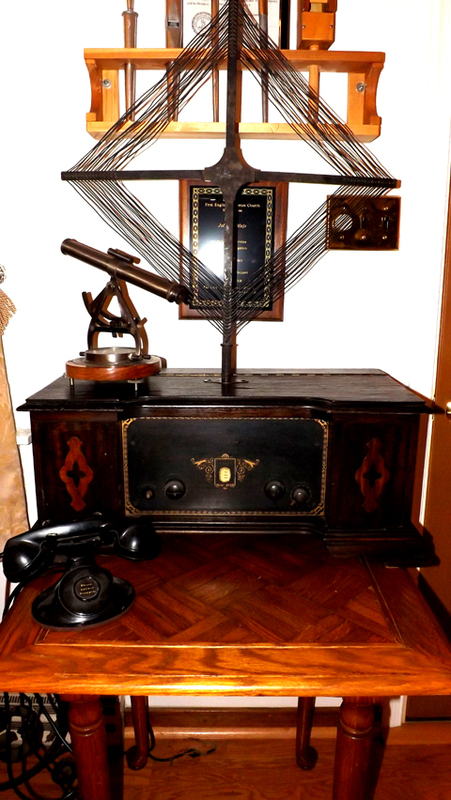 A very well done re-creation of the radio room on the ill fated RMS Titanic. Historic photographs vouch for the accuracy of the display. 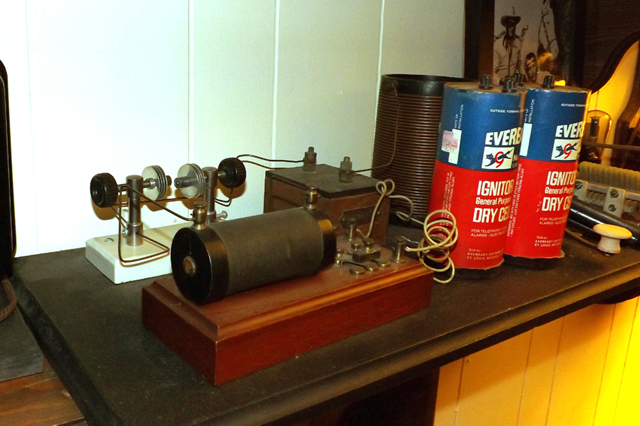 Note that all of the equipment is from the early "spark" era, and no vacuum tubes exist in any apparatus used in that early Marconi period. 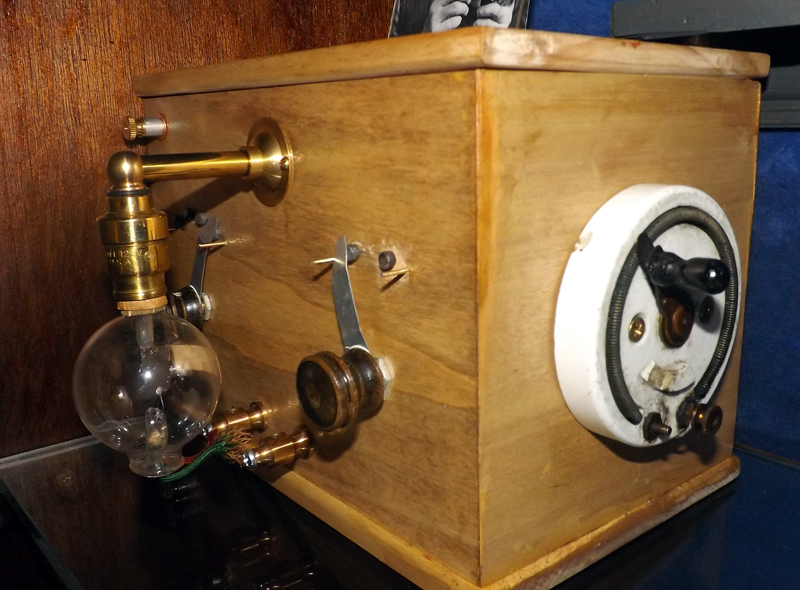 Before the discovery of the Vacuum Tube, radio transmission was limited to tuned spark signals emanating from spark gaps utilizing thousands of volts of electricity. These signals were difficult to tune to a small frequency bandwidth, so spark stations often interfered with other stations. 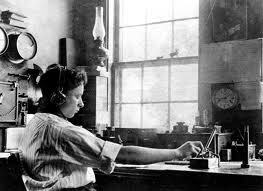 On the receiving end, detection of these signals was limited to the use of elements such as Galena crystals, which had the effect of rectifying electro-magnetic waves coming through the air so that they could be heard on an earphone. 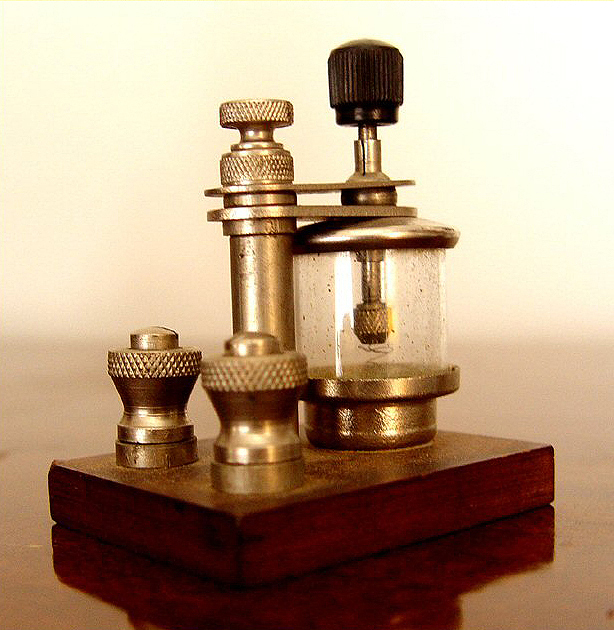 Even after the vacuum tube came into use, and modulated (voice and music) radio was perfected, many could not afford the expensive receivers of the day, so use of crystal based radio sets carried forth well into the late 1920s and beyond. Many who grew up in that era, tell stories of building their own crystal sets using wire wrapped on cylindrical oat meal boxes such as the familiar Quaker Oats containers. 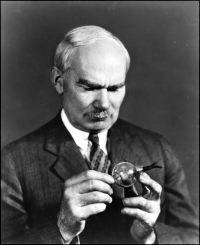 It was not until Major Edwin Armstrong perfected the superhetrodyne receiver circuit, that single tuning control, tube radios became popular, and crystal sets became more in the way of science projects for technically astute youths, than as practical radios for the home. This page salutes the lowly crystal set in its various forms of sophistication. 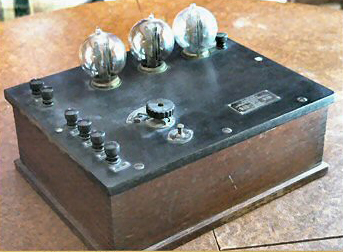 The device above is an early experimenter's spark gap transmitter, typical of what would have been used by amateur radio operators in the very early 1900s. Transmitters of this type could only produce bursts of radio frequency waves that covered a wide spectrum, and were limited to un modulated CW or code. 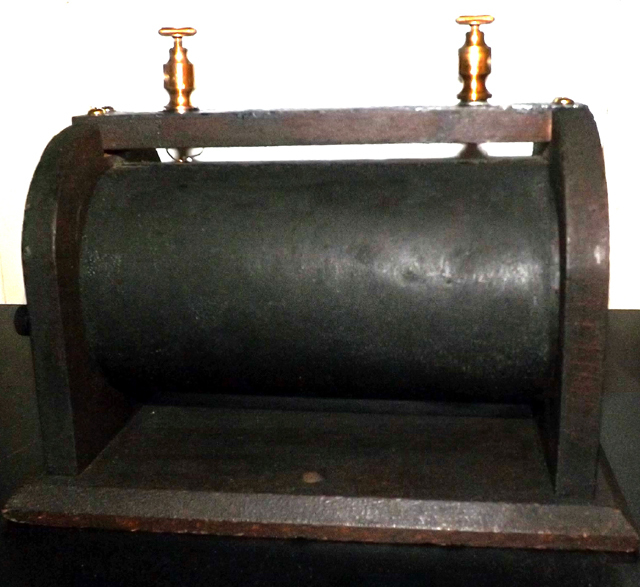 It was not until the vacuum tube became available, that electronic oscillator circuits and audio modulation became possible. 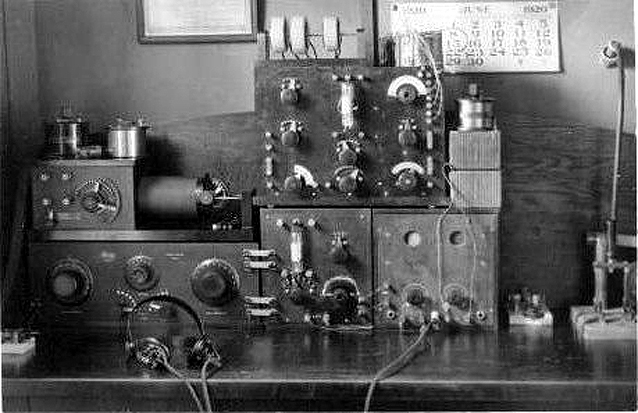 This view of an early 1900s ham radio "shack" illustrates how equipment was built using somewhat crude home made implements and readily available electrical components of the day. Many present day amateur radio enthusiasts still pride themselves on being able to construct the equipment that they use in their hobby. 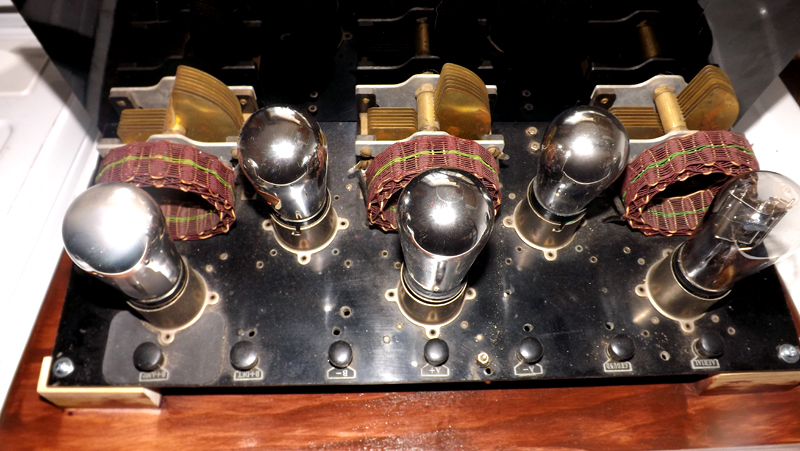 The museum's authentic DeForest Spherical Audion tube. 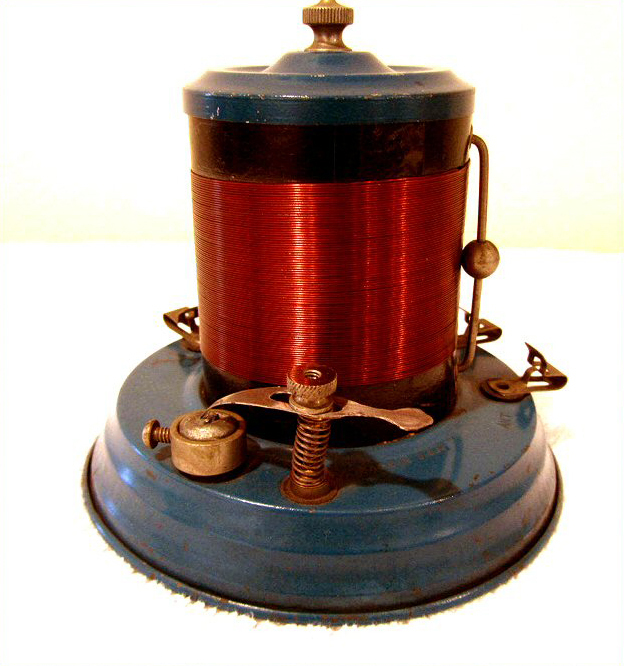 An early variable inductor used in conjunction with a high voltage spark transmitter. 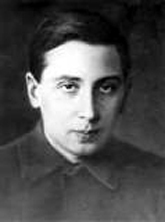 The crystal set was first invented by Oleg Losev, (1903-1942), a Russian scientist and inventor in the field of semi-conductors. His work eventually led to the development of the transistor and eventually to light emiting diodes. Without having completed his formal education, and without the benefit of collaboration, Losev managed to become one of the foremost physicists in the development of solid state electronics. 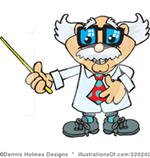 Aside from the crystal set, his work was mostly overlooked until the 1940s when research in semi-conductors was again awakened by World War II. 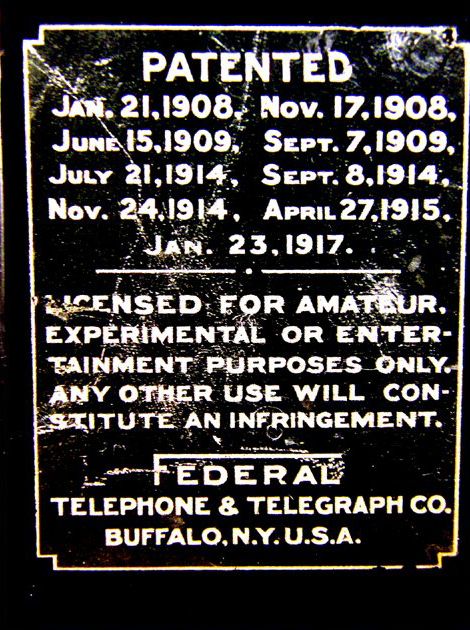 Below is the manufacturer's label showing patent dates. 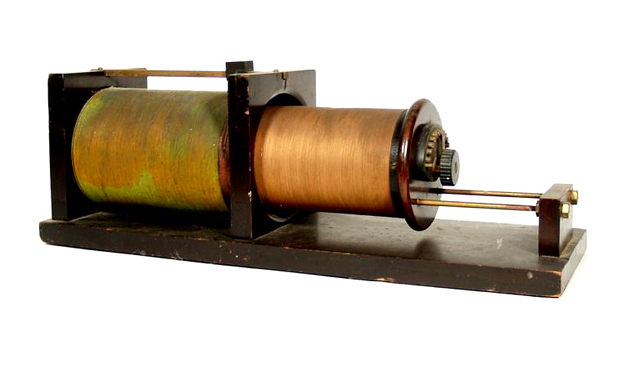 An open Paragon variometer or coupler manufactured by Adams-Morgan Company of Montclair, N.J. 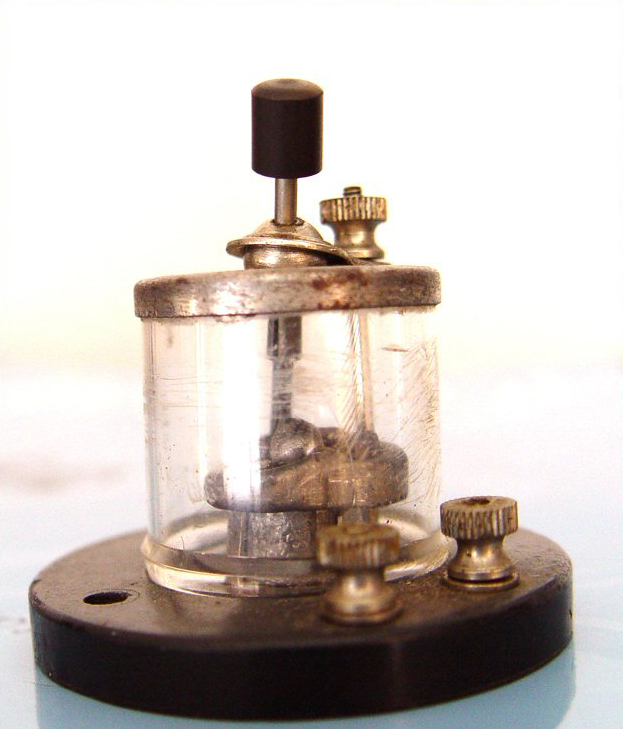 The item dates to the early 1900s and was typical of the rotary variable couplers used in TRF receivers of the period from about 1913 to 1923. 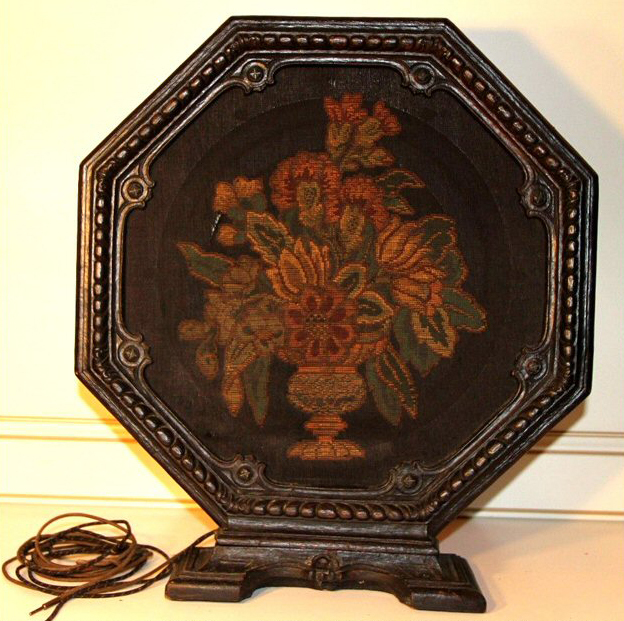 This item is gift to the Museum Of Yesterday by a friend of the DeMajo family. 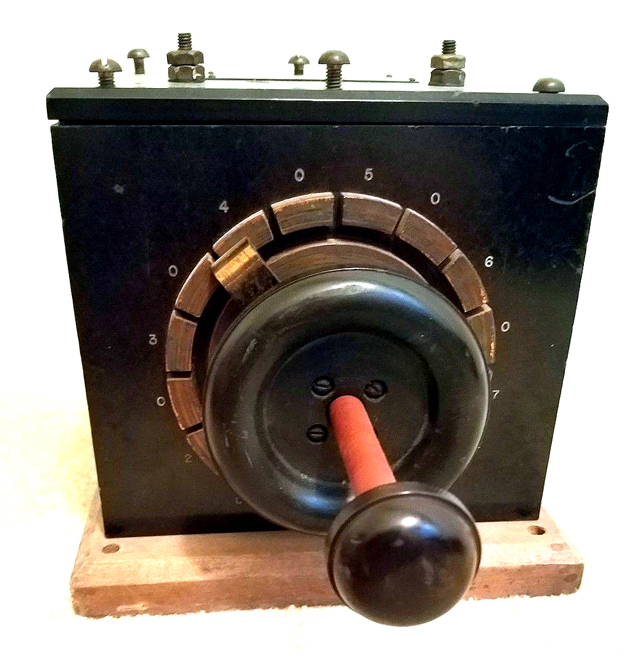 Signal Radio Company "Loose Coupler" type inductor dating to around 1914. 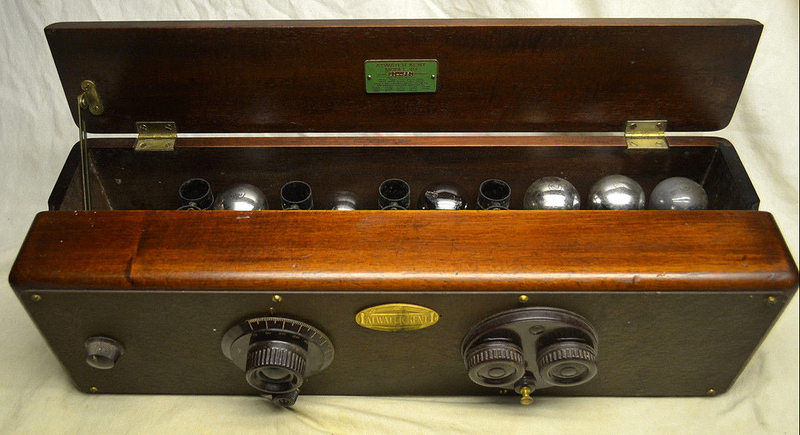 The William Duck Company was a major supplier of early radio parts and equipment. The "loose coupler" device, shown above, was probably sold through that outlet. 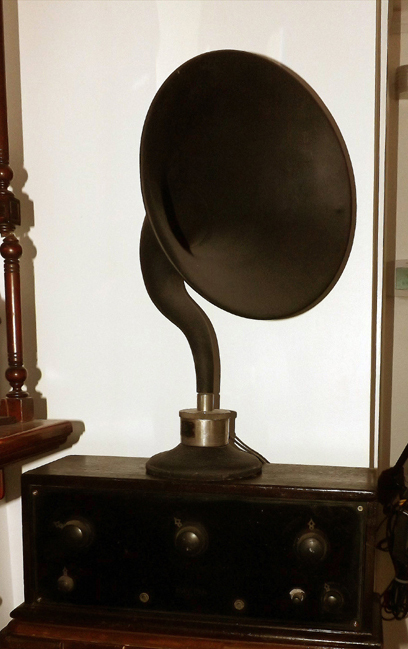 It is one of the rarer pieces from the museum's early wireless era collection. The Duck Co. started in Toledo in 1908 when William B., a lawyer who had developed an interest in wireless, went into the mail order radio parts business with his brother, John J., an electrical contractor. The company was called the J.J. Duck Co. They sold all kinds of radio parts made to their specifications under the Duck brand name. In 1914, John withdrew to attend to his contracting business and the name was changed to the William B. Duck Co. 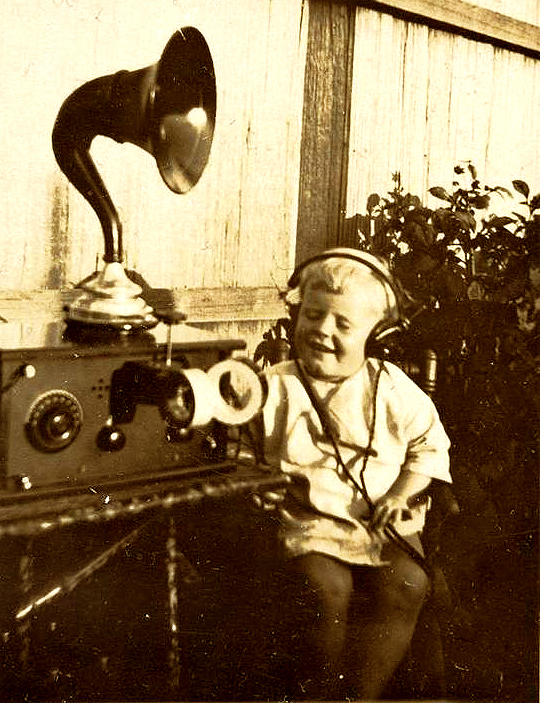 Duck was in a unique position when broadcasting began in 1921. He offered everything needed by the home builder. Business boomed until 1925 when factory-made sets cut into the parts business for home builders. He operated radio station WHU in Toledo. He struggled into the depression, but finally sold off his inventory and closed in 1932. He retired at the age of 52 and died in Marietta, GA in 1952 at the age of 71. 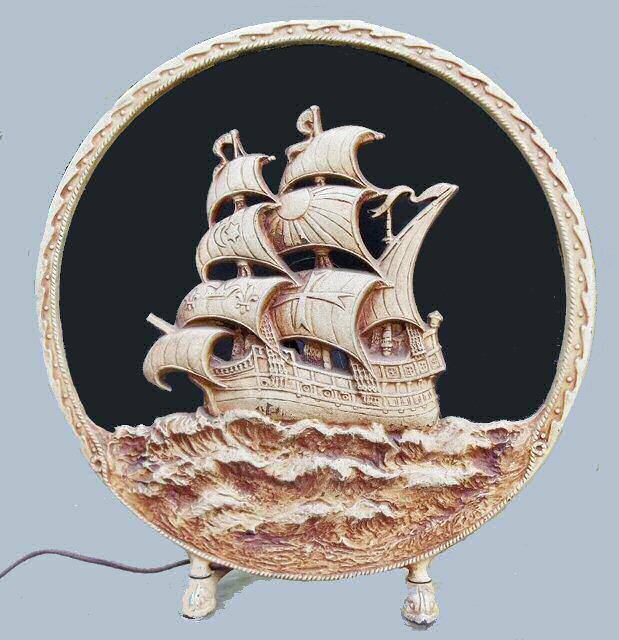 Maison Blanche began to sell early radio apparatus in the 1920s when the store partnered with the Saenger Brothers, who owned a chain of motion picture theatres in the South, to establish WSMB, one of the first radio stations in the United States. 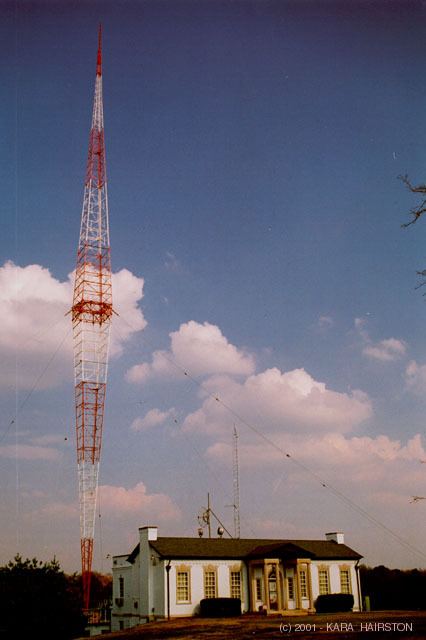 WSMB (call letters stand for Saenger-Maison Blanche) and WWL, which was born as an experiment in the physics lab at Loyola University Of The South in New Orleans, were pioneer broadcasters in the era when commercial radio broadcasting was just emerging following Dr. Frank Conrad's experiments in broadcasting at the Westinghouse KDKA radio station in Pittsburgh. 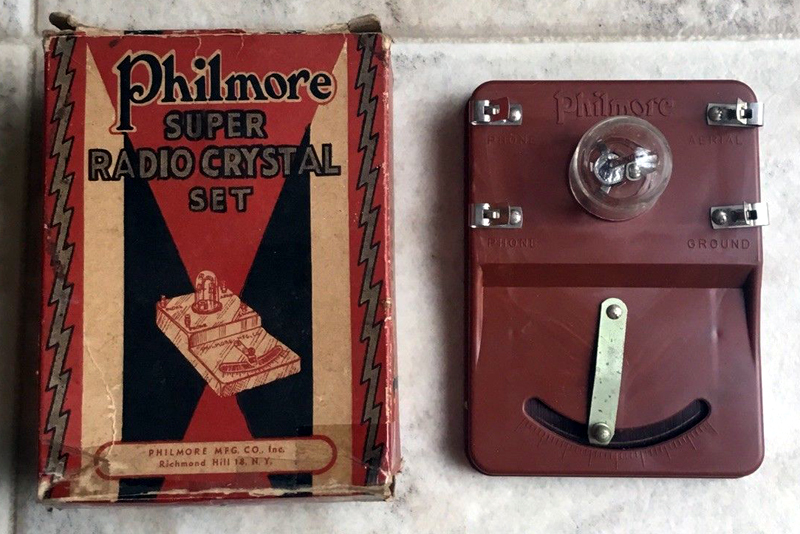 Although it is a later form of crystal radio, this early portable, made by the Pakette Electric Corp. of Kearney, NE., was one of the first post WW-II crystal sets to employ fixed crystal diode detection instead of the "cat whisker" used in earlier crystal sets. 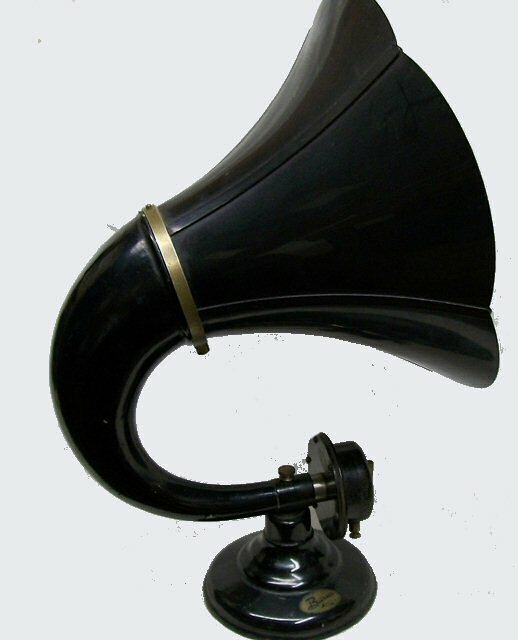 The device also contained a built-in 600 ohm headphone for listening. 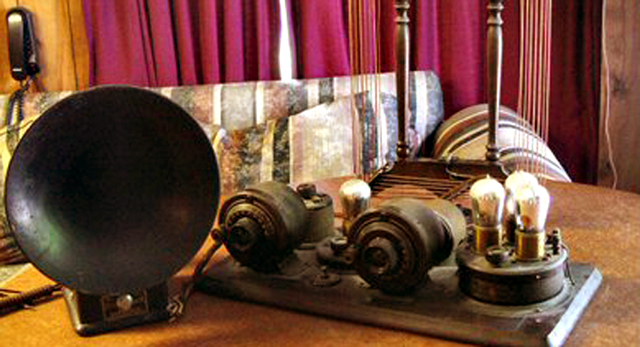 This 1920s Marconi type "XYZ" crystal receiver tuning coil is a recent addition to the museum collection. 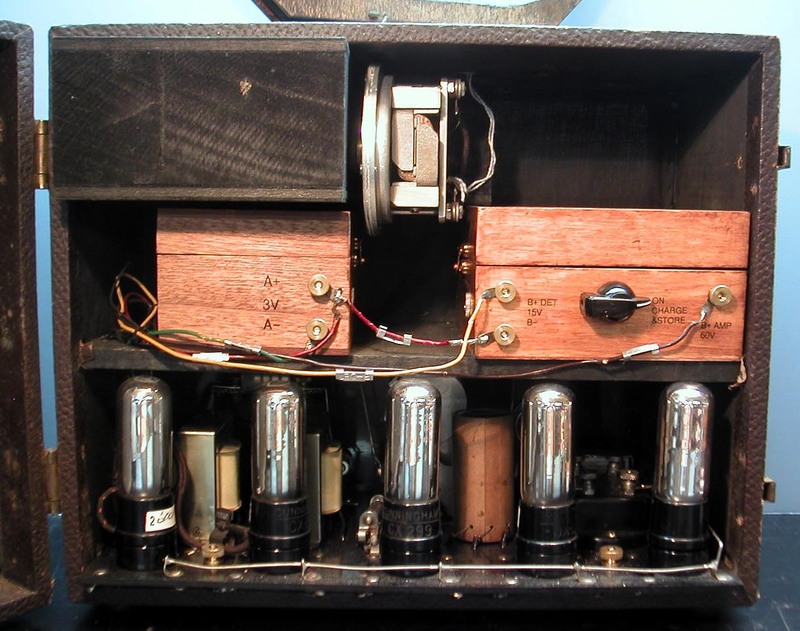 With the introduction of the Audion tube, a new generation of radio receivers became possible. 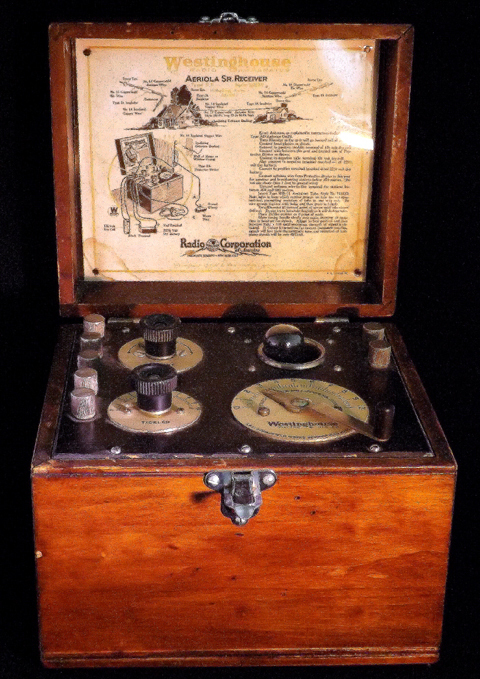 Work by Maj. Edwin Armstrong, brought first the "Super-regenerative" receiver and later the "Super--hetrodyne" set onto the market. 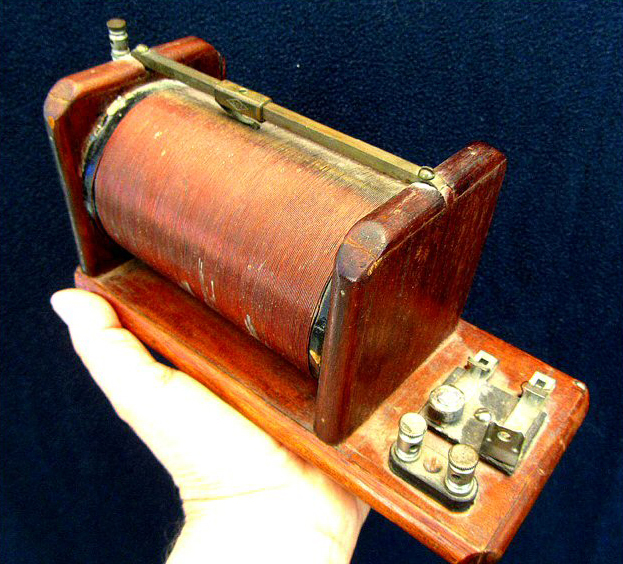 Early radios were battery powered since many American homes did not have reliable electricity at the time, and reliable rectification of AC power had not reached acceptable levels. By the mid-1920s however, AC power supplies were being manufactured both as part of new set construction, and as retrofits for existing battery sets. 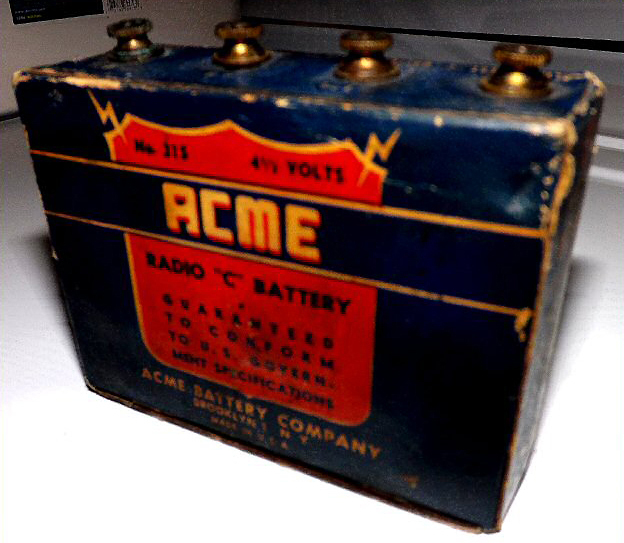 Most radios of the day required an array of strorage batteries which provided filament voltages usually in the 2-6 volt range, and B+ or plate voltage batteries which ranged anywhere from 22 -90 Volts. 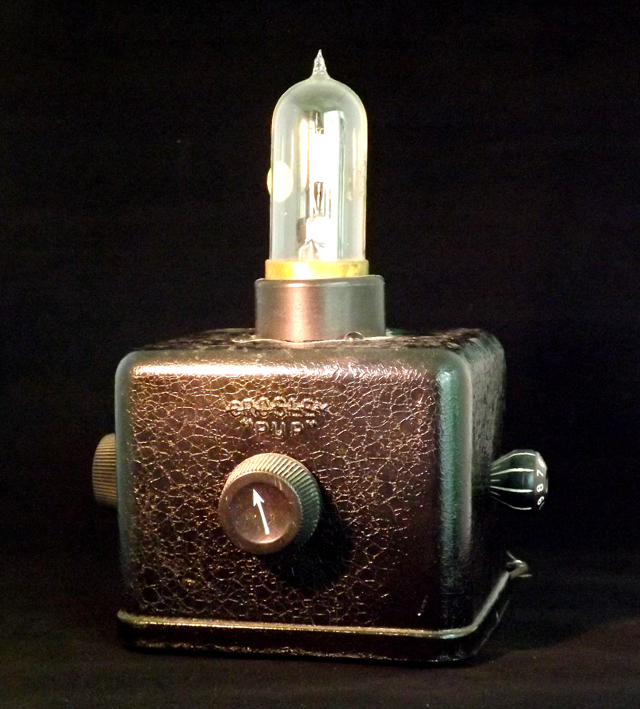 With the discovery of the Audion vacuum tube by Dr. Lee DeForest, industry leaders began to realize that spark era and crystal set radio experimentation was about to give way to the practical use of Radio as an entertainment and information device for American homes and businesses. 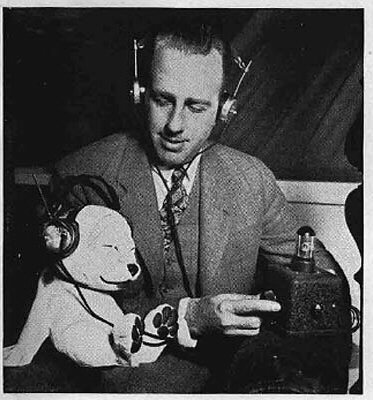 Experiments by Dr. Frank Conrad, a researcher with Westinghouse Electric, had proven that broadcasting radio signals, containing voice and music, was practical. 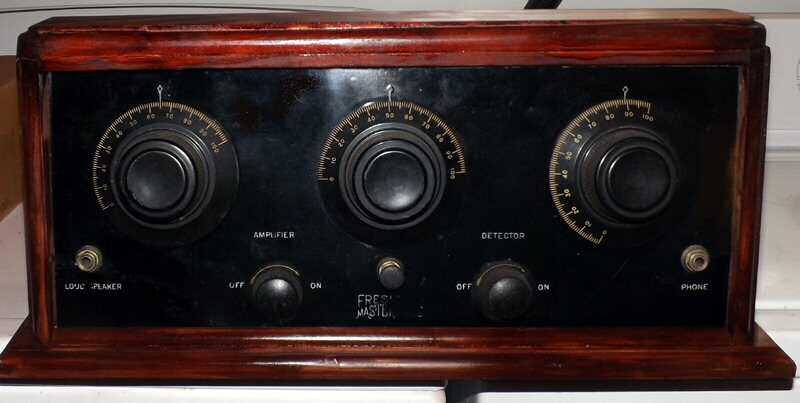 As Dr. Conrad prepared to begin broadcasting with an experimental station from the roof of the Westinghouse plant in Pittsburgh, Pennsylvania, the company began releasing a packaged detector-amplifier unit which was to serve as the first commercially manufactured home radio receiver. 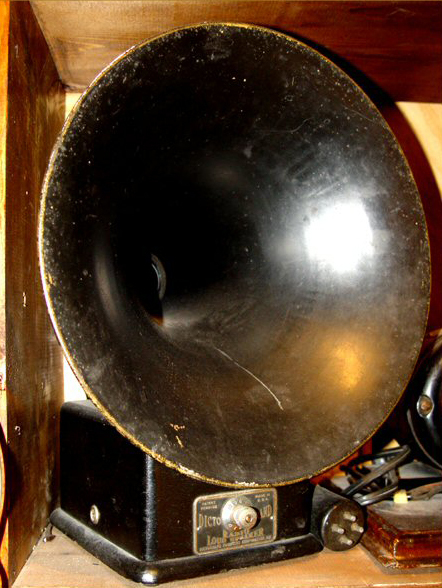 The photo above is of the museum's Westinghouse "RA-DA" detector-amplifier, acknowledged to be the first commercially manufactured radio receiver intended as an entertainment and information radio for the American home. Shortly after these sets went on the market, Dr. Conrad began regular broadcasts on what was to become Radio KDKA, the nation's first commercial AM radio station. 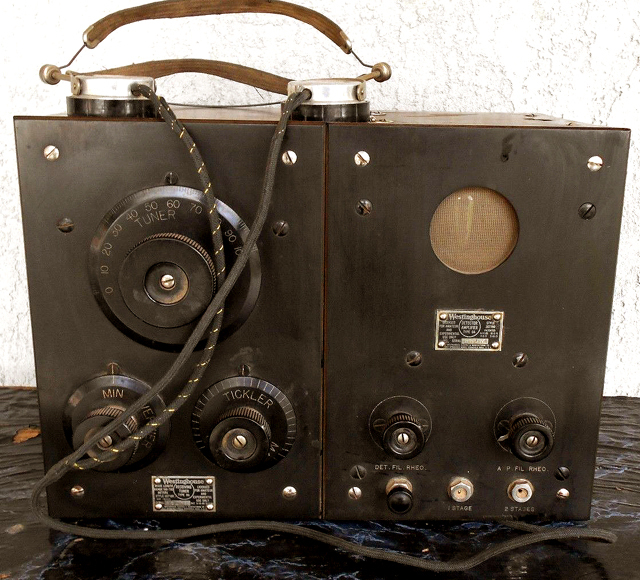 The museum's prized Atwater Kent "Breadboard" Model 9C radio which is another early pioneer commercially made set intended for home use. 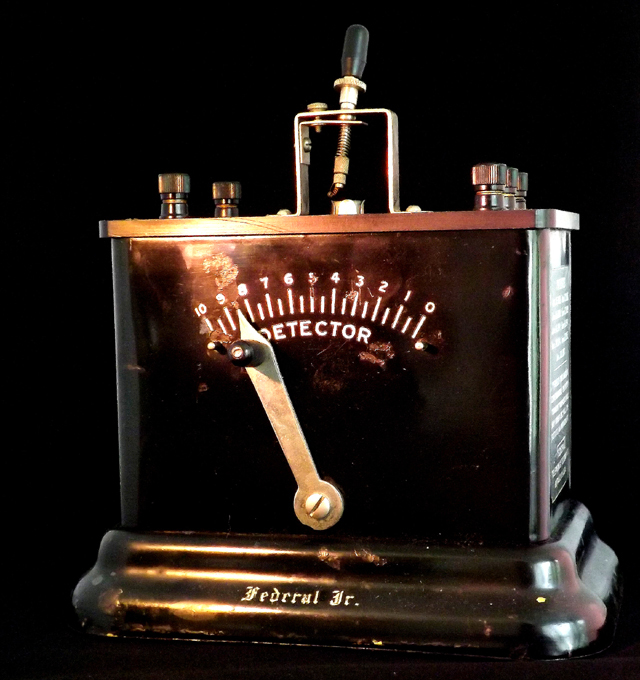 1925 FADA "Travler" portable radio which was recently added to the museum's early battery receiver collection. The manufacturer's full name designation is F.A.D. Andrea Radio Company. It was started by Frank d'Andrea in New York. d'Andrea later sold F.A.D. 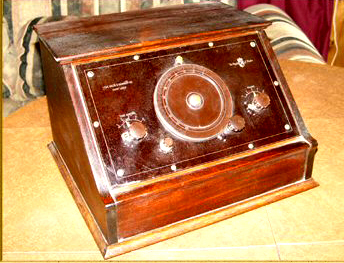 Andrea and founded a new company in 1934 called Andrea Radio. 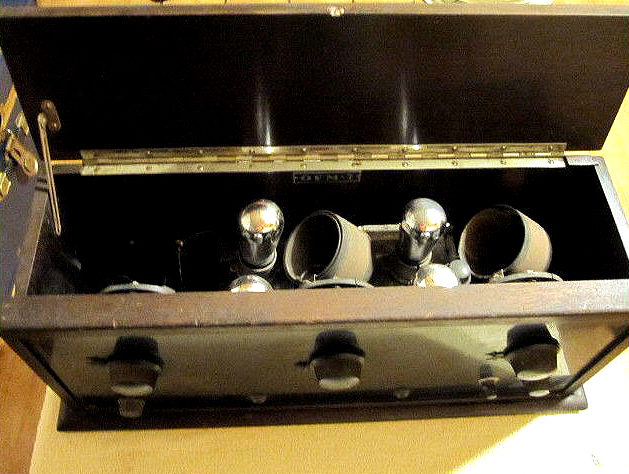 The "Travler 5" uses five UX-99 tubes and has a built-in wooden horn speaker. Rear view of set shown below. 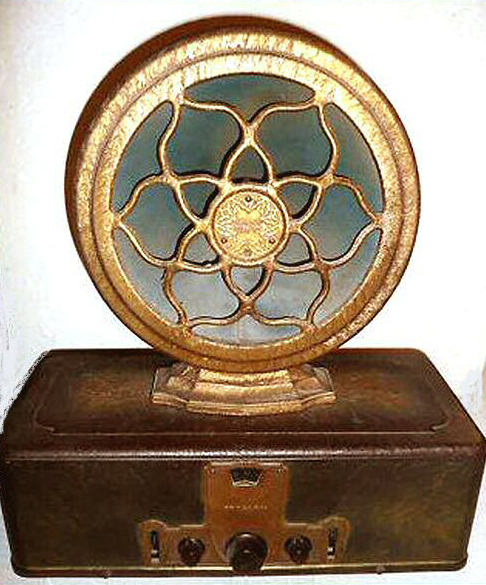 1925 Kolster K-20 seven tube radio, manufactured by Brandes Products Corporation, shown with Atwater-Kent Model "M" speaker and Bodine loop antenna. 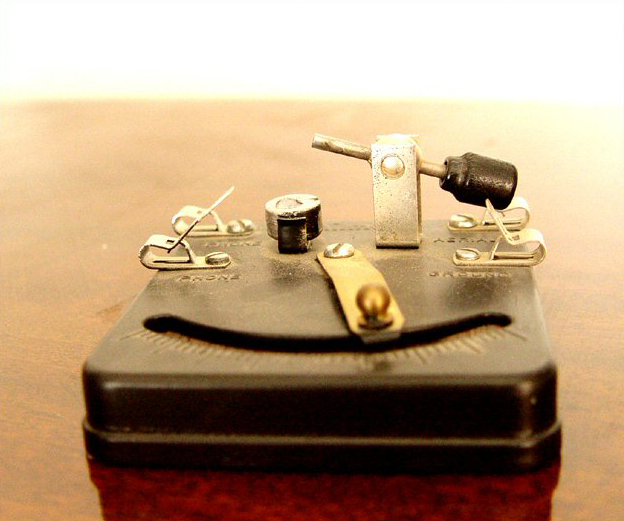 This set was originally manufactured as a battery powered radio. 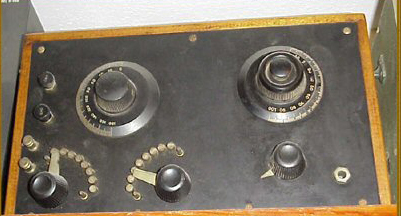 When AC radios came into the market place, the manufacturer produced an AC battery eliminator on an extender chassis, that could be built into the set's existing cabinet. This set is equipped with such a device. The marble top and cherry wood table, also in the photo, came from a Louisiana Antebellum plantation home which was owned by a branch of our family. 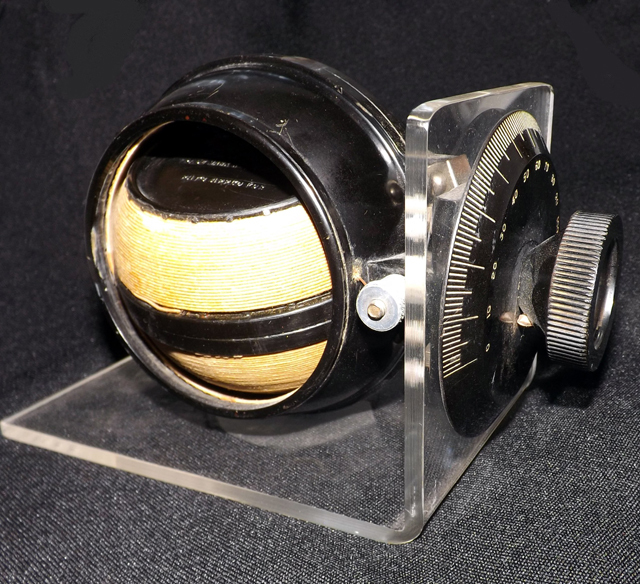 This six tube Crosley "Bandbox" Model 601 Neutrodyne receiver is a recent acquisition to the museum's communications equipment collection. 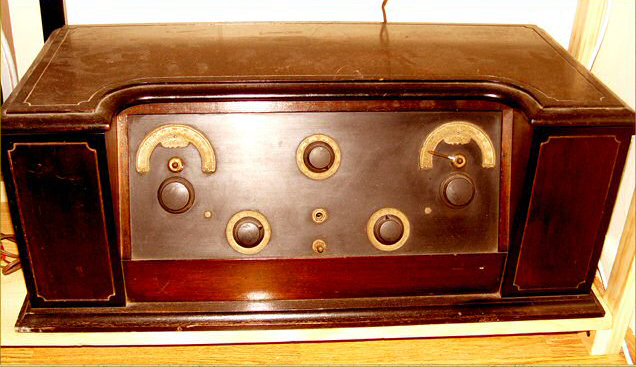 It is a prime example of what would have been considered a "high-tech" receiver in the 1928 marketplace but, like all Crosley products, it was built with economy in mind so that it would find it's way into as many potential homes as possible. 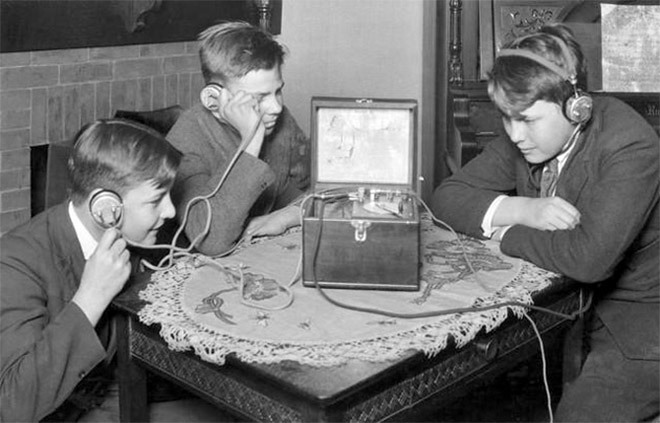 Above, a photo of three boys listening to a 1920s RCA-Westinghouse Aeriola Radio, along with a photo of the Museum of Yesterday's own Westinghouse Aeriola receiver. 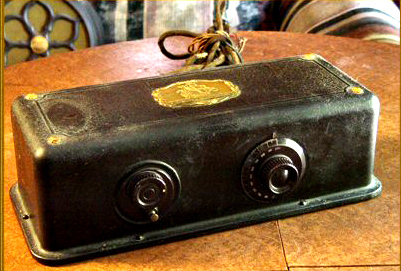 The Atwater-Kent Model 49 receiver is one of the later battery powered sets manufactured just prior to the introduction of AC powered radios. 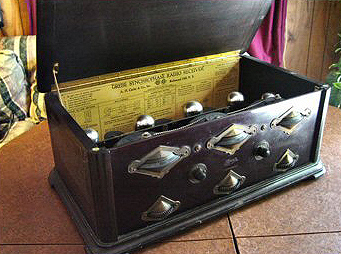 Early radios relied on banks of batteries for both filament and high plate voltages. Typical batteries were of the lead-acid type. Above is a six cell lead acid battery from the 1920s that was typical of that era. Sulfuric acid and lead plates formed the chemical reaction that produced around two volts DC per cell. Along with battery radios, came batteries. 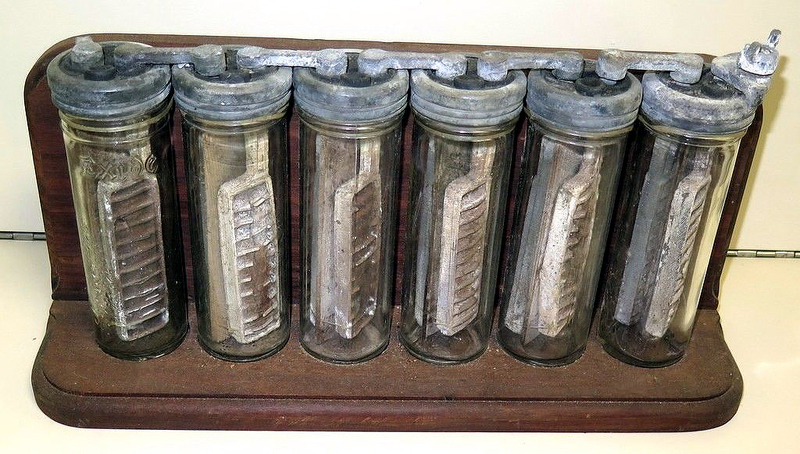 Above are some examples of the "wet" and "dry" cell batteries used in early radio sets. 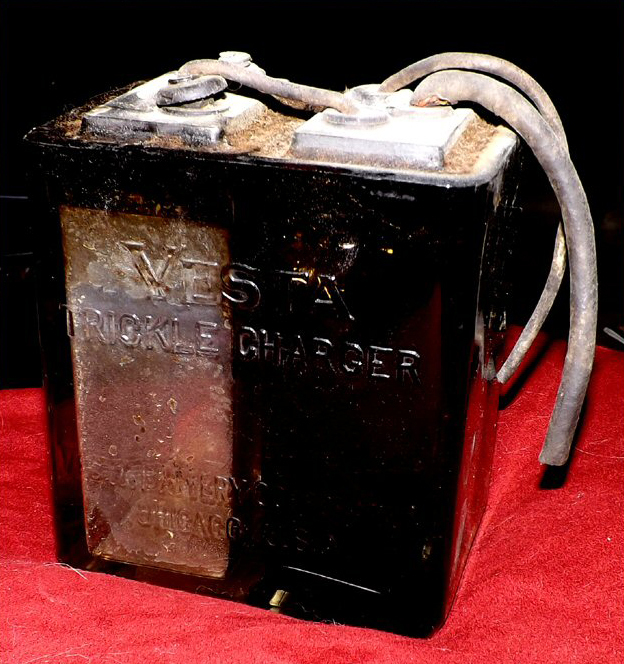 The glass battery is a lead-acid storage battery with a built-in trickle charger. 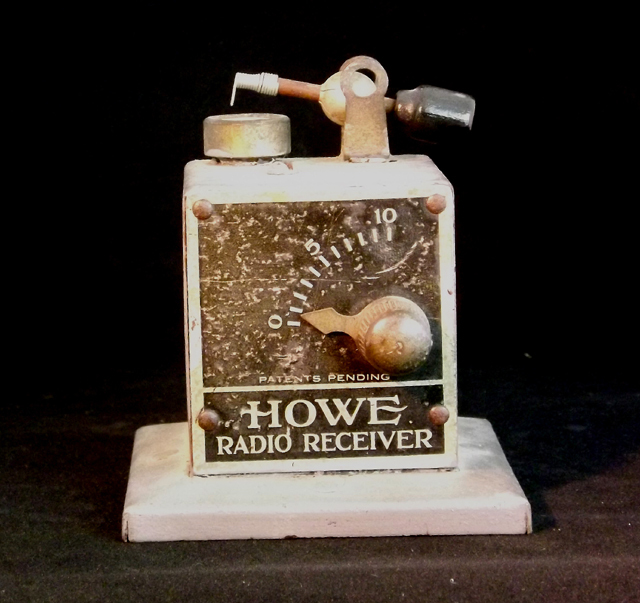 It was sold along with Atwater Kent's early battery radios such as the Model 9C shown lower on this page. 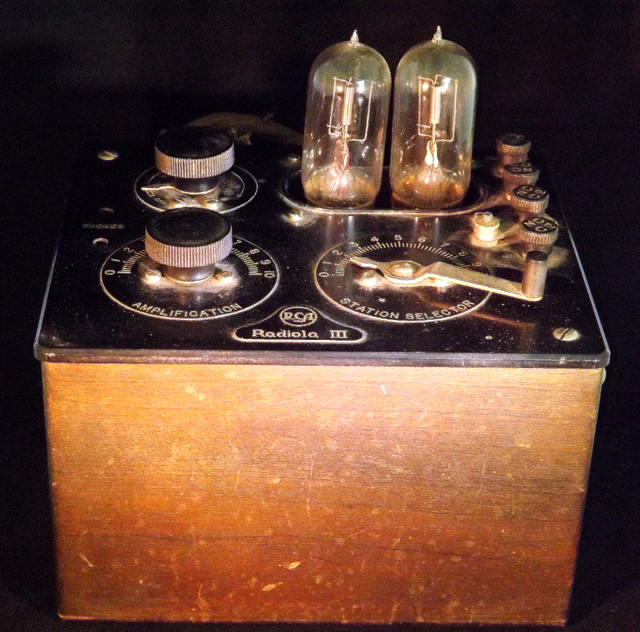 The "C" cell shown in the other photo, is a "bias" battery used to provide a small voltage required to balance grid current in early tube amplifiers. 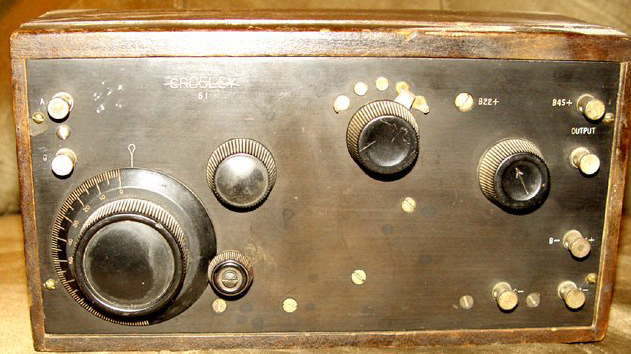 Many local radio dealers also offered a battery service contract where a technician would visit the set owner's home at regular intervals, to service or replace the radio batteries. 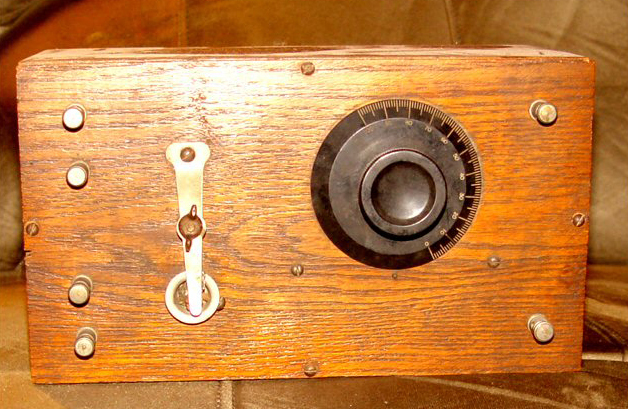 In the very early days of manufactured radios, the Atwater-Kent Company produced and sold a line of early tube radios which were constructed on wooden boards. 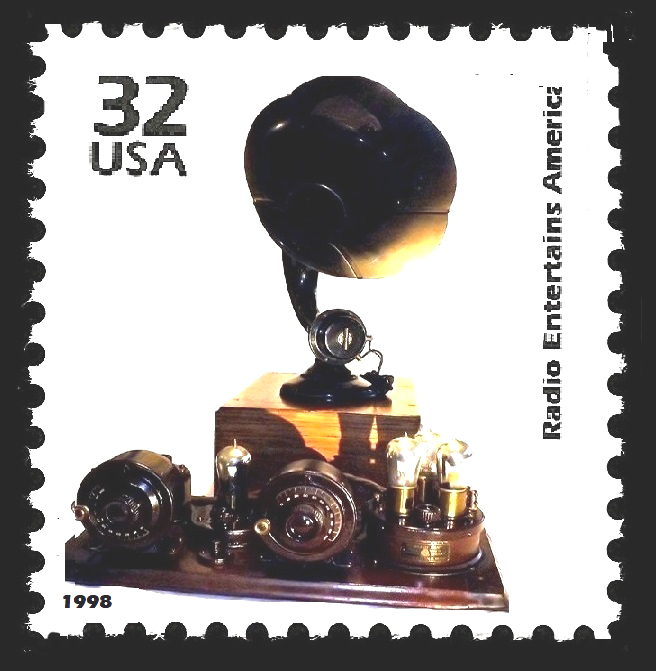 The A-K Breadboard radio, as these sets were known, was later revisited in the form of a commemorative thirty-two cent stamp issued by the U.S. Postal Service in 1996. 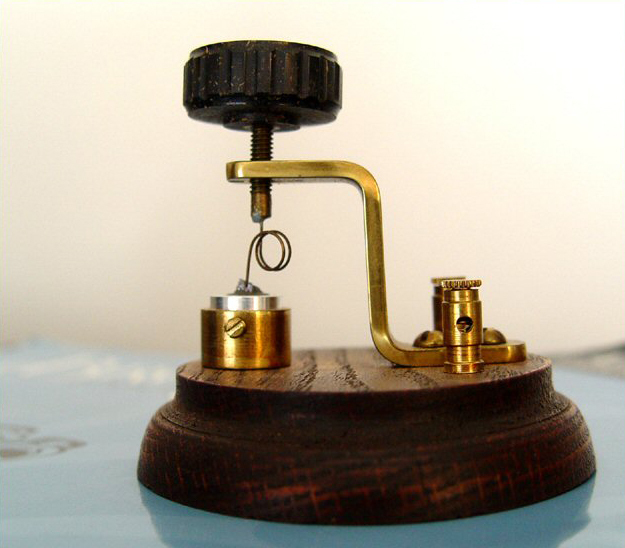 The photo directly below illustrates the design of that stamp, depicting, in drawing sketch form, an A-K breadboard and Burns model 205-D horn speaker. 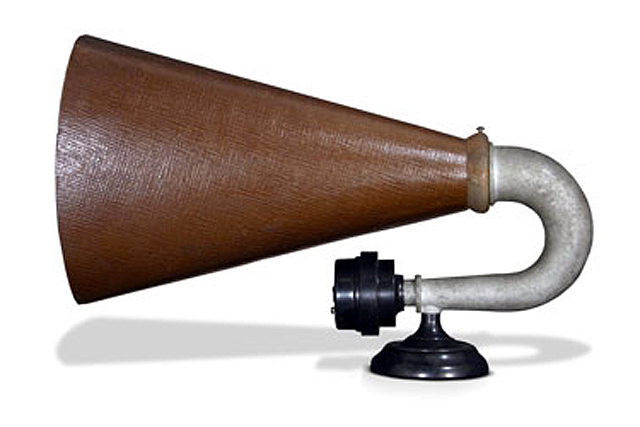 Although the Burns horn speaker, that appeared with the AK radio on the face of the stamp, would not have typically been used with that model of Atwater-Kent set, our art department decided to re-stage the Post Office's illustration by creating a photo of an actual A-K 9C Breadboard along with a Burns 205-D horn speaker from the museum's collection. That actual photo is shown in the second frame below. 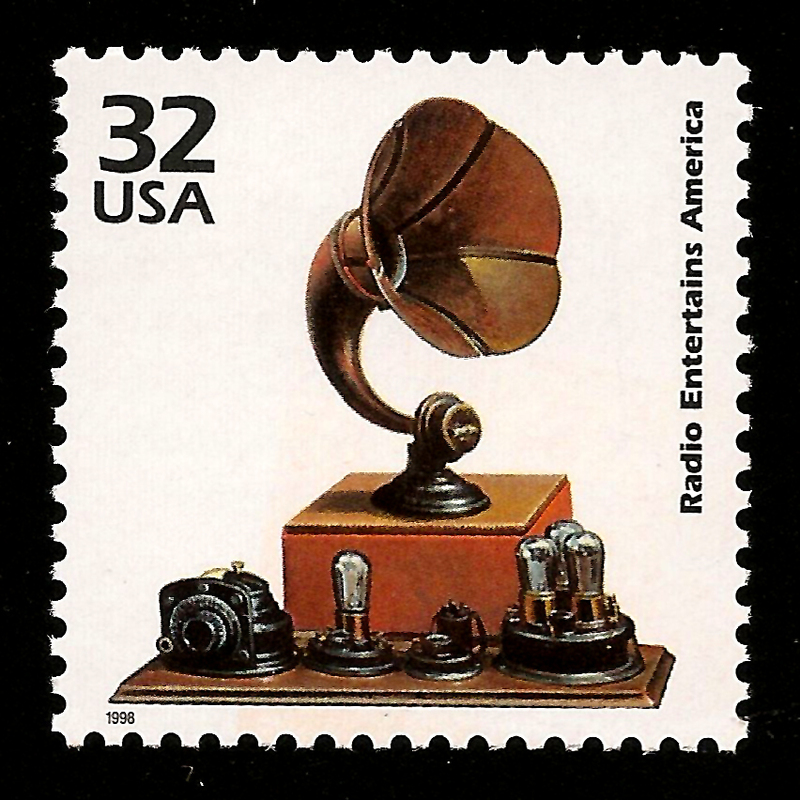 Above: 1996 commemorative U.S. postage stamp drawing representing an A-K "Breadboard" radio and Burns horn speaker. 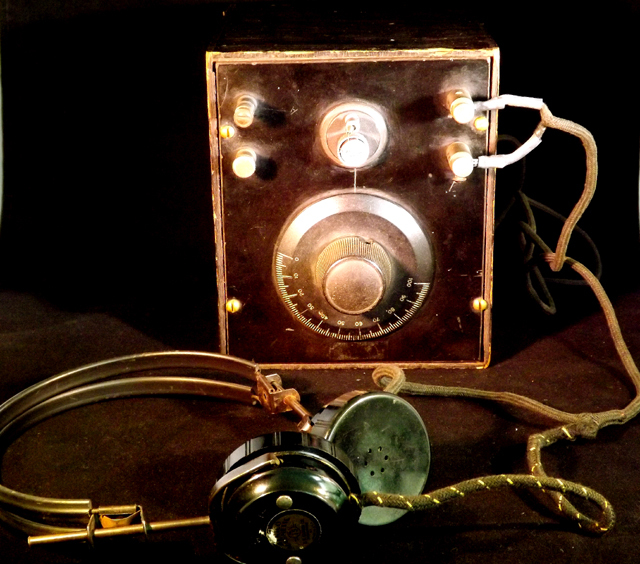 Below is the same scene, in the form of an an actual photo created using a radio and speaker from the museum's collection. Note: A manufacturer's manual for the installation of Atwater Kent breadboard radios is available. A major 1920s competitor of Freed-Eisemann and Atwater-Kent, was Charles Freshman Co. 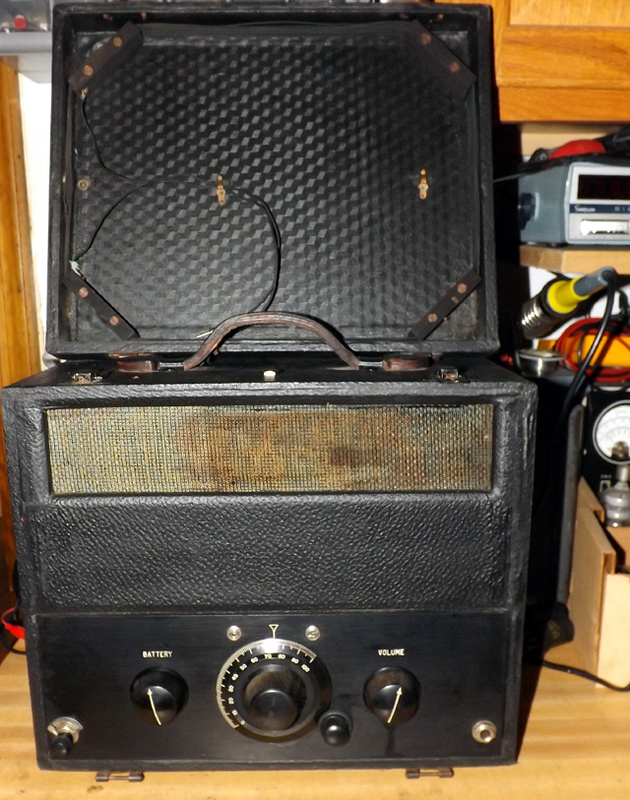 The Freshman Masterpiece was an inexpensive ($60) radio that offered reasonably good performance for the price. 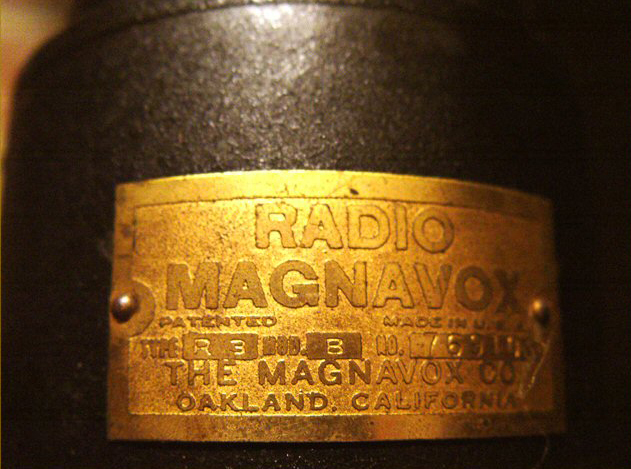 The Masterpiece became the first radio for many American families. The photo below illustrates the unique air wound couplers used by Freshman. Click photo for schematic. 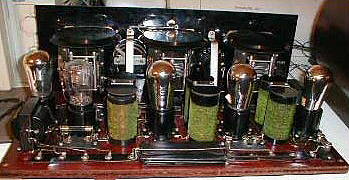 Radiola 18 is one of the last sets made before the transition to AC powered radios. 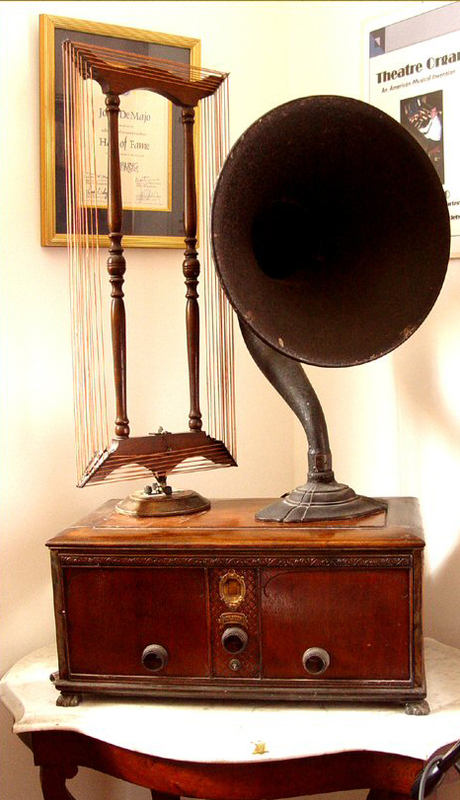 This set's matching Radiola Model 103 tapestry speaker is shown i0n the speaker section below. Priess "Straight Eight"receiver fitted with iconic DeForest D-10 "ether collector" antenna. The manufacturer coined the term "straight eight" from automotive lingo of the day, specifically the coming-of-age of the straight eight cylinder automobile engine, which alluded to power when it came to gasoline engines of that era. The radio boasted a straight line of eight tubes, with the signal being passed from tube-to-tube as it was amplified into audible sound that was sufficient to drive a large loud speaker from a relatively weak radio station. 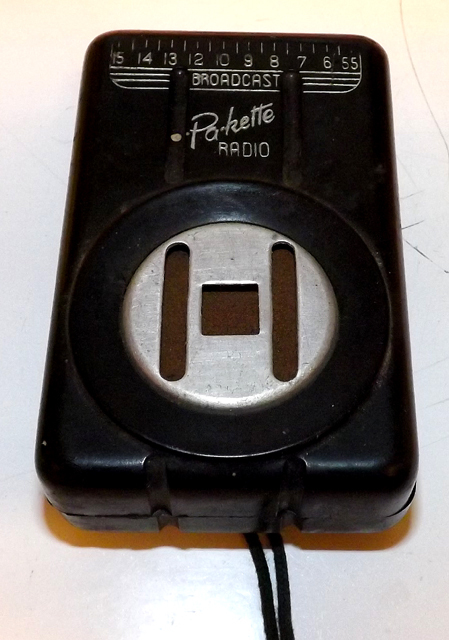 Although Priess radios were held in high esteem because of their power and sensitivity, they never really enjoyed the popularity of other brands of the day such as Atwater Kent, Crosley or Radiola. 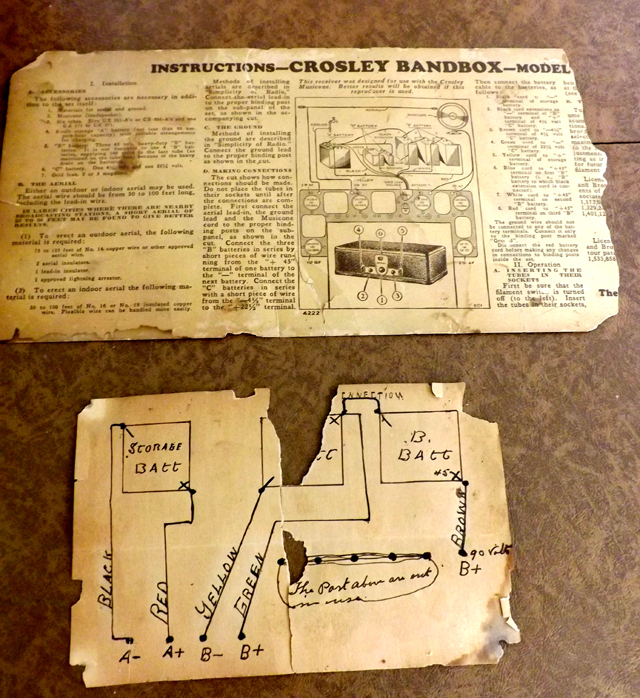 The Story of the Crosley "PUP" radio. 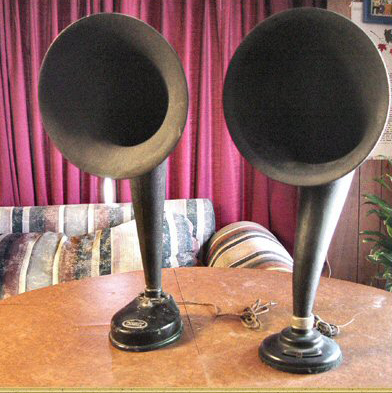 Utilizing the invention of the vacuum tube, The Crosley "Pup" was a step up from a Crystal Set. 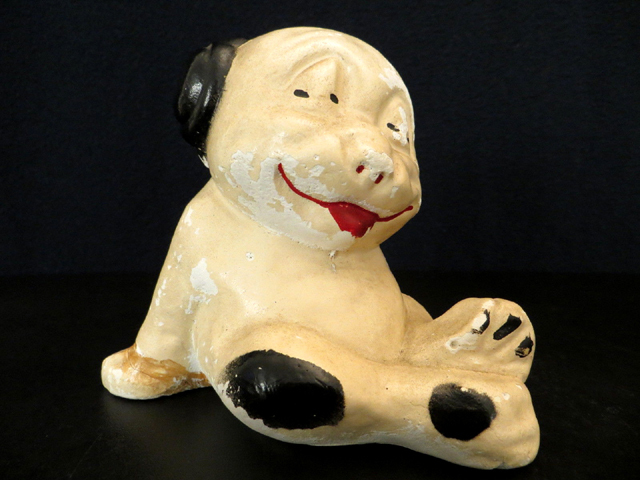 Below is a photo of the museum's recently acquired "Bonzo." Bonzo and our prized mint condition Crosley "Pup" radio are the centerpieces of the Museum of Yesterday's tribute to the Crosley Radio Corporation and the company's radio station WLW, Cincinnati. 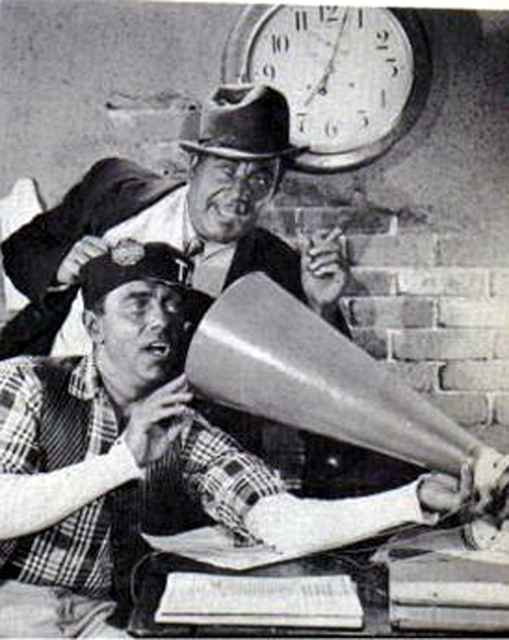 Freeman Gosden and Charles Correll, in a WMAQ - Chicago publicity photo advertising their long running "Amos 'N Andy" radio program. 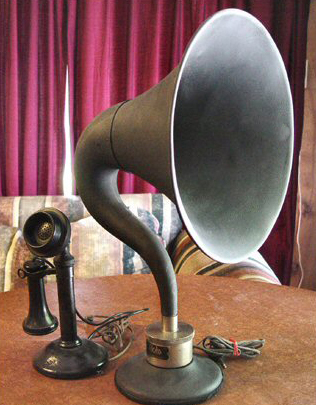 The photo includes a Murdock 500 horn speaker as a prop. 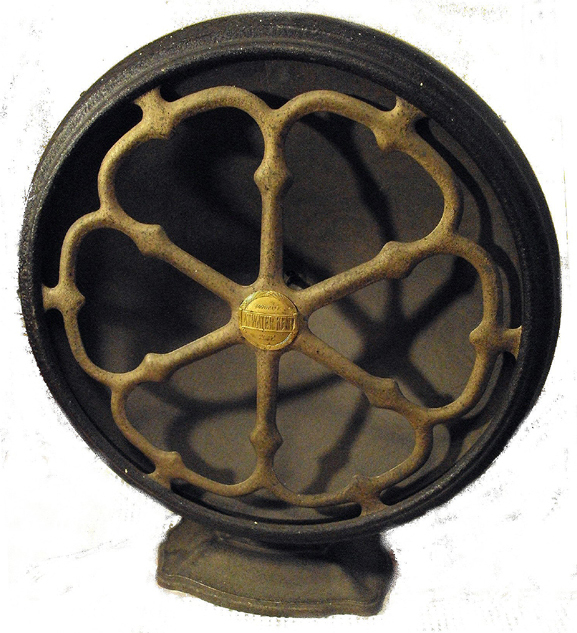 A recent addition to our collection is this rare Tower "ship"motif speaker. 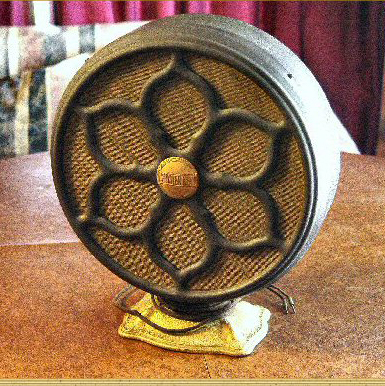 An early Radiola Model 103 tapestry covered cone speaker designed for use with early battery sets. 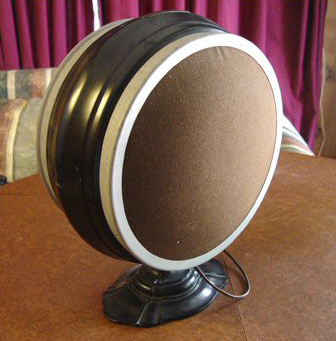 The original model in the Atwater Kent "Model E" speaker line. 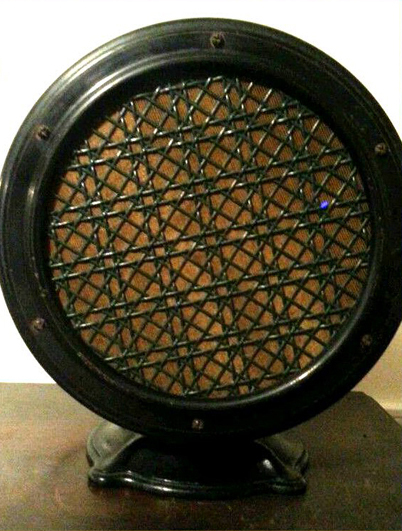 A later Atwater-Kent Model E-3 cone speaker from the early 1920's. 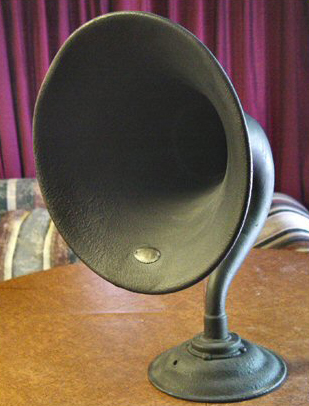 A wooden cone-type speaker, manufactured by Peerless, from the 1920s. 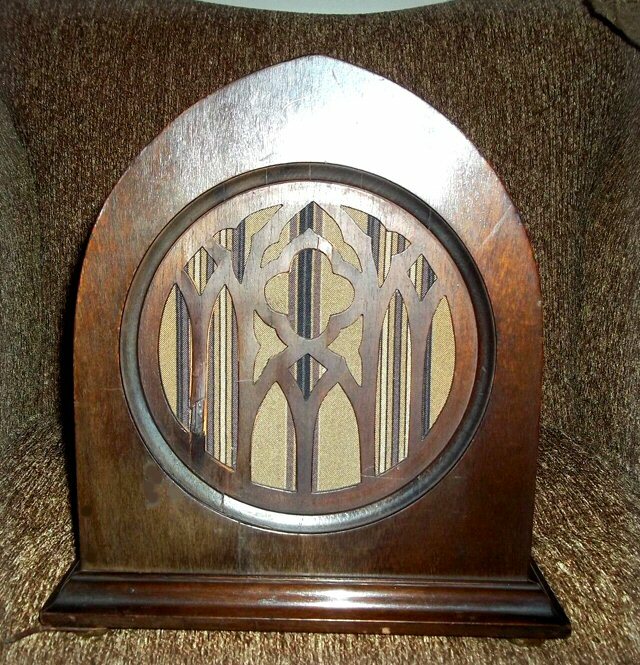 One has to wonder if this cabinet may have been the artistic influence for the "cathedral" radios that would emerge in the following decade. 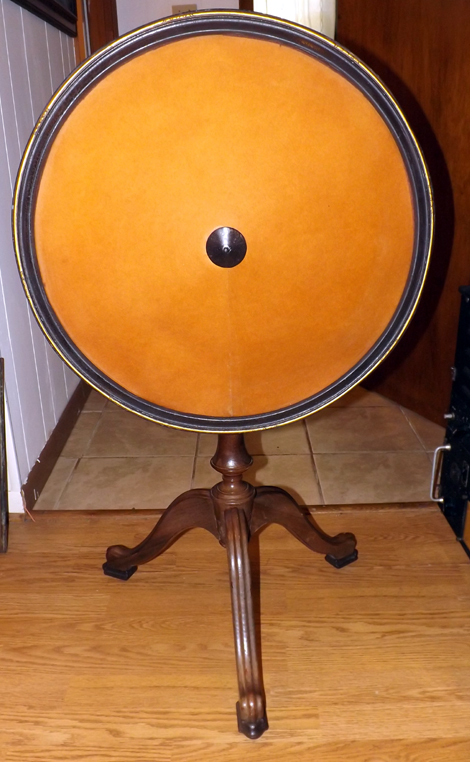 Ornate "Loop Aerial" by the Bodine Company of Chicago, Il. "The Wonder Of The Wireless"